It’s November 2018 and we have 2 weeks holiday. 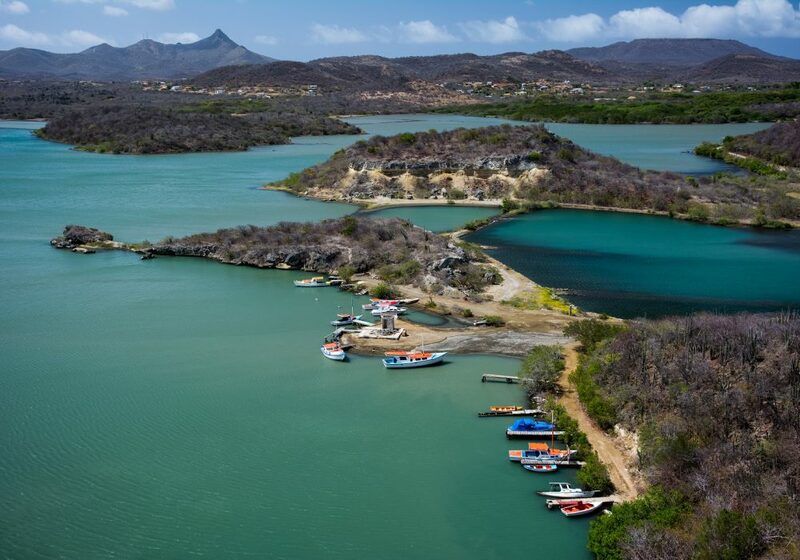 We do have certain demands: we don’t want to fly to far, we want guaranteed sun, safety and a good mix of culture, nature and being able to relax in the sun. This time we added an extra demand; no Zika viruses flying around and a good medical standard. This was because I was pregnant of our third daughter. So, what’s left to go? 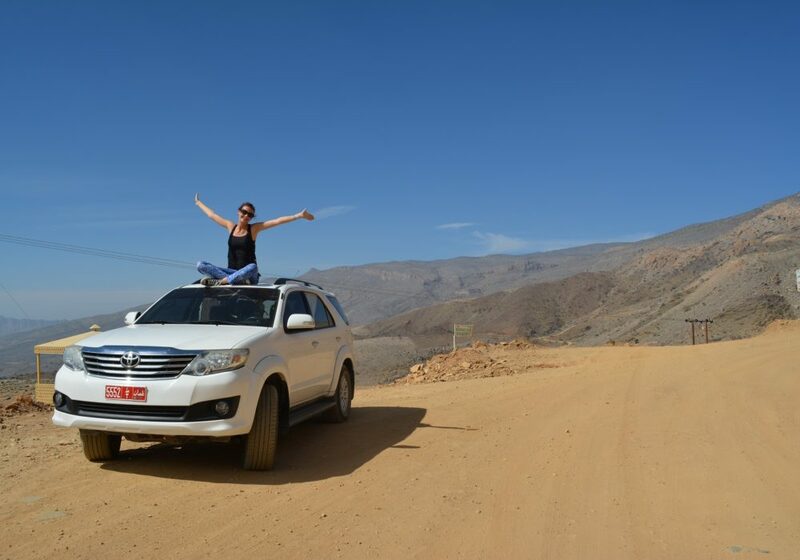 After taking a look at the map of the world our attention got drawn to a rather undiscovered pearl: Oman! Yes! This country meets with all of our demands. Shortly after, we booked our round trip through Oman. 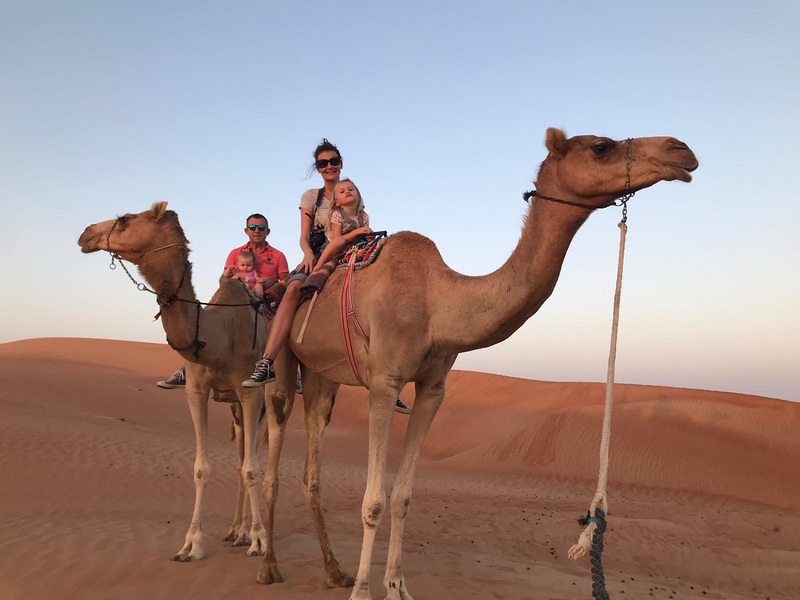 I would love to take you with us on our round trip through Oman with kids. At 08:30 in the morning we check ourselves in at the KLM check-in desk for our flight to Muscat, through Dammam. We’re in luck because there is loads of room on the plane so our youngest daughter (of 2 years old that sits on my lap) gets her own chair. Here we come Oman! After a good flight, we land on Muscat at 22:00 hours. As we walk through the airport we see straight away that we have landed in a very wealthy country. Such a luxurious airport.. At customs everything goes really quick. We walk out into the airport and someone is waiting for us with a sign that has our name on it. The chauffeur takes us to our accommodation in 20 minutes; the Coral Muscat Apartments and hotel. Such luxury again… But we’re off to bed soon as it’s rather late! 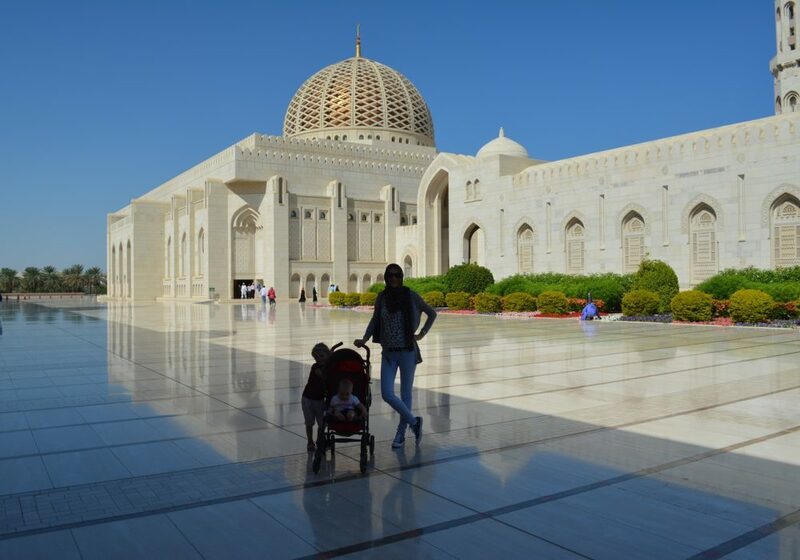 Today we stay in Muscat to get to know the place a little. We set the alarm in time as our rental car was supposed to be delivered at the hotel at 9:00. As it turns out it isn’t delivered until 10:00. We are a little irritated as we had wanted to be at the Sultan-Qaboe mosque by this time, which is the largest mosque of Oman and closes at 11:00 hours. We drive to the mosque as fast as possible and arrive there at 10:30 hours. Luckily the mosque itself makes up for all the effort. It’s beautiful! Everything is made of shiny marble with gold leaf and every tree and every piece of grass is cut perfectly. So wonderful! After the mosque we feel we want to do something else but the kids are rather exhausted, so we drive back to the hotel. Luckily, they have a pool there. While dad goes swimming with our eldest, mum takes a nap with the youngest. We notice the kids really need to get used to their surroundings, so we don’t mind hanging around the pool for the remainder of the day. Our four-wheel drive gets dropped at the hotel at 9:00 hours and this time they are on time. And so, we leave Muscat and head towards Nizwa. On the way there, we take a look at Birkat Al Mauz, mud houses that are stuck to mountains with a beautiful oasis underneath. 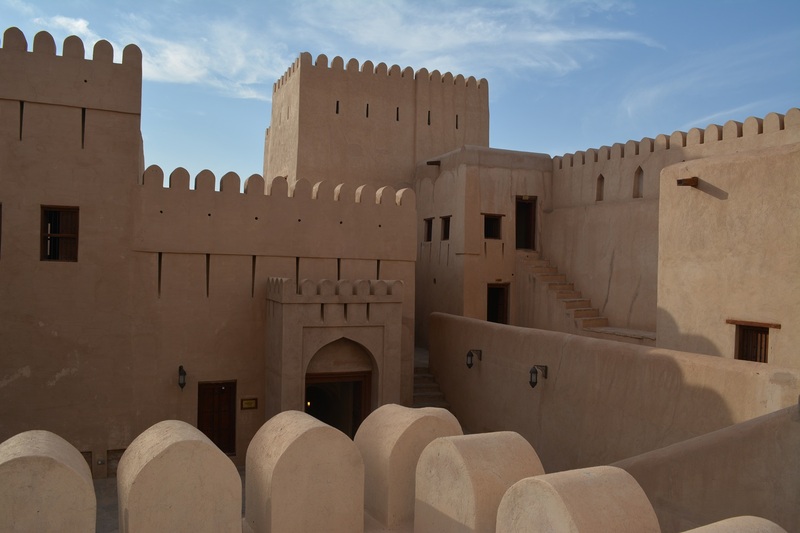 When we reach Nizwa we look for a place to have lunch. We pass a large shopping mall and decide to take a look. Would you believe they have an ice-skating area in the mall while it’s 35 degrees outside? The mall offers lot’s for children too, because of the large play paradise. After lunch we head to Jabrin and visit Jabrin Castle, which looks stunning. Oman has lots of castles, but this is said to be one of the nicest. We visit the Bahla fortress too, but this is closed unfortunately. It does look beautiful from the outside though! And after this we head on back to Nizwa and look for our hotel. We stay at the Al Diyar hotel, which is a little kitschy but fine to spend 2 nights in. 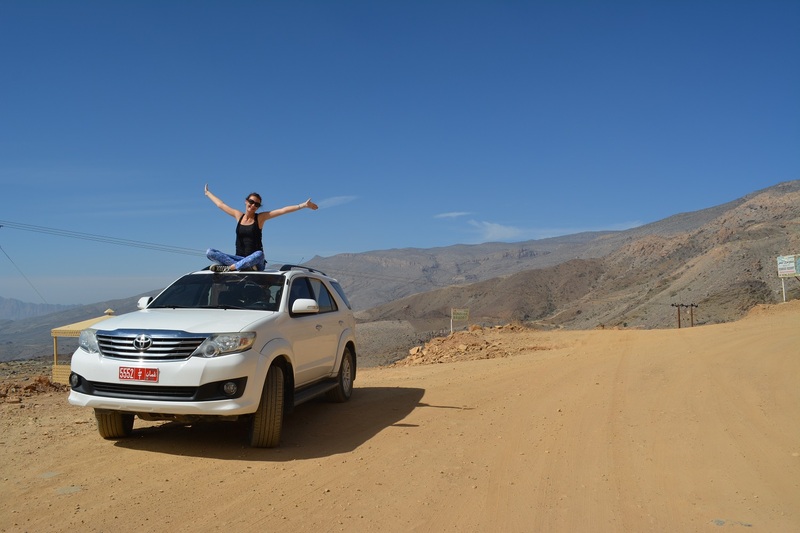 Today we stay in the Nizwa region and head to Jebel Shams in the morning, which is the Grand Canyon of Oman. The road that takes us there is beautiful. We take the car high up into the mountains from where we can go for a beautiful walk. We were planning on taking the “Balcony Trail” but the road turns into a dirt road at a certain point. This is where we learn that our daughter of 10 months old is not a big fan of driving off road. She get’s rather hysterical and seeing as we don’t want to keep her this upset to our expense, we decide to turn the car around. What we did see on our way was very nice though ;). And so we head on back to Nizwa, have lunch and drive into the old city centre. 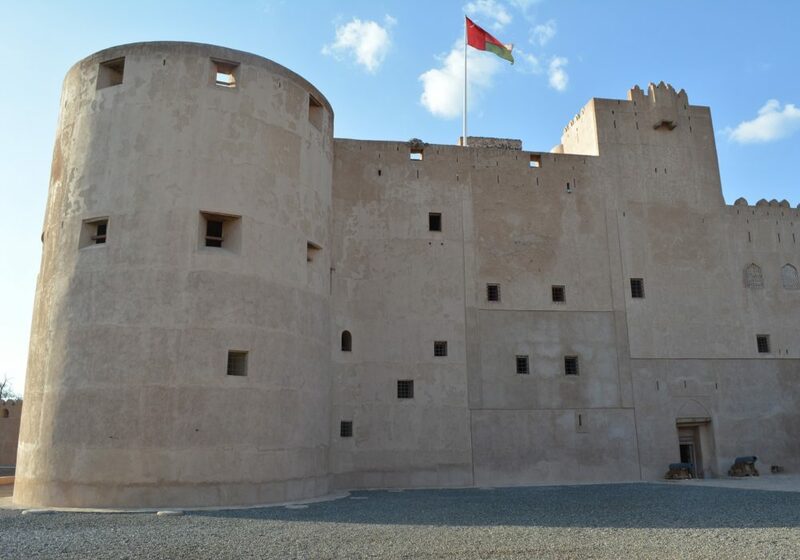 There you have the Nizwa Fortress where we decide to take a look. Stunning! This is fun for kids too as our oldest like to see it as some sort of middle aged playground. 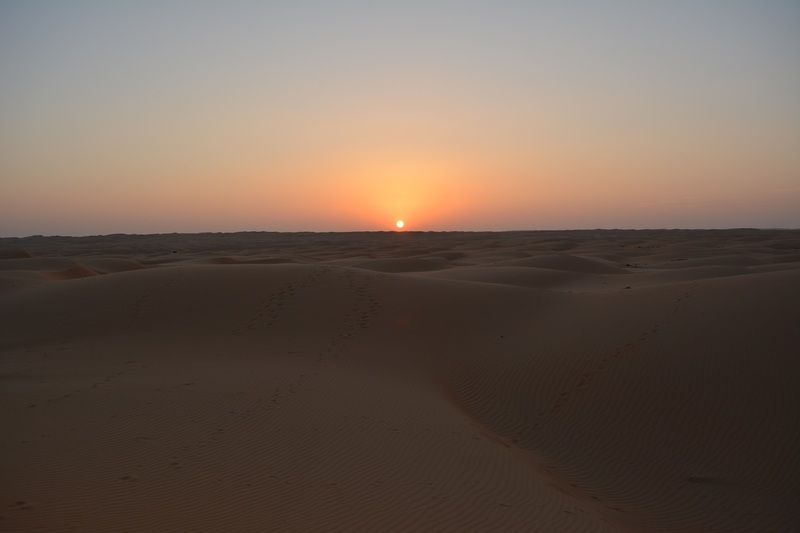 Today we leave Nizwa and set course to Wahiba Sands. This is quite the drive. On our way there we stop to have lunch in Ibra but can’t find any good places to have lunch. Just old, shabby little shops. So we try the next village and stop in Al Mudayrib. No food here either, just funny little towers. All the villages we drive through are like ghost towns, so we arrive at “the gate of the Wahiba Sands desert” rather famished at the end of the day. There, we wait for our guide to take us through the desert to the desert camp where we shall spend the night. Luckily our youngest does enjoy this type of off road. The loose sand flat tires turns our vehicle in a type of hoover craft and little miss bumpy ride is fine with that! We drive through the beautiful gold and yellow sand hills and after half an hour we reach our camp in the middle of nowhere and get assigned to our fun little hut. The hut is completely decorated in Bedouin style with an outside shower and toilet. So cool! Then it’s time for a camel ride. We bump and bounce into the dunes and witness the most beautiful sunset we have ever seen. The desert dunes turn into all kinds of colors gold and yellow and we realize this is very special to be able to share with our children! After sunset we bounce back to our tent camp and have dinner. After dinner there isn’t some hysterical belly dance show with bright lights and loud music but a simple camp fire. Lovely! Back to basic, no TV, no WiFi, no power, just an oil lamp a camp fire and the bright starry sky. At 6:30 we get woken by the sound of chirping desert birds. We get dressed, get out of our hut and find ourselves in the middle of the desert. After a quick breakfast we pack our bags and race on back towards civilization. This was so cool! After this we decide to visit a wadi, which is a type of oasis, named Bani Khalid. This is beautiful too. Oman steals more of our hearts each day. We walk towards the wadi and have bite to eat and dip our feet into the water. Just lovely! Afterwards we head on the coast. It’s a long drive again and we here too, all the villages we pass through are ghost towns. The habited world seems very far away. When we reach the coast, we find a (rusted) old playground where our eldest can enjoy herself a bit. Afterwards, we drive to Ras al Jinz, the turtle mecca of Oman. It is low season for the turtles however, so we skip the turtle search walk and head to bed. Today we drive the last piece already, towards Muscat. Along the way we stop at a port town, Sur. After driving through nomans land for two days this is finally a lively place. We stop at a beach and put our feet in the water. Lovely! The next stop is Wadi Shab but this wadi is not as good as the one we saw the day before. Some kind of local party is happening here and as soon as the locals catch a glimpse of our blonde, chubby, western baby, they all come shooting towards her and want to hold her. Our next stop is at the blue pool sinkhole, which is a deep hole in the loam with bright blue water in it. 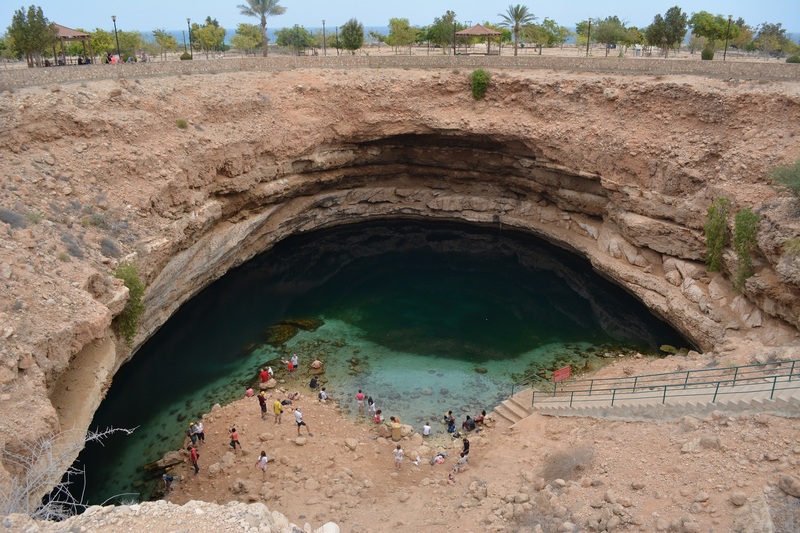 The hole is located in a nicely laid park full of playgrounds, so this makes it a great visit for kids. After dipping our feet and having a go on the swings we drive on to Muscat. We have quick lunch at the Mac (the pregnancy is giving me a huge quarter-pounder craving so I’m very pleased!) and we’re off to our resort where we get to relax for the next three days! 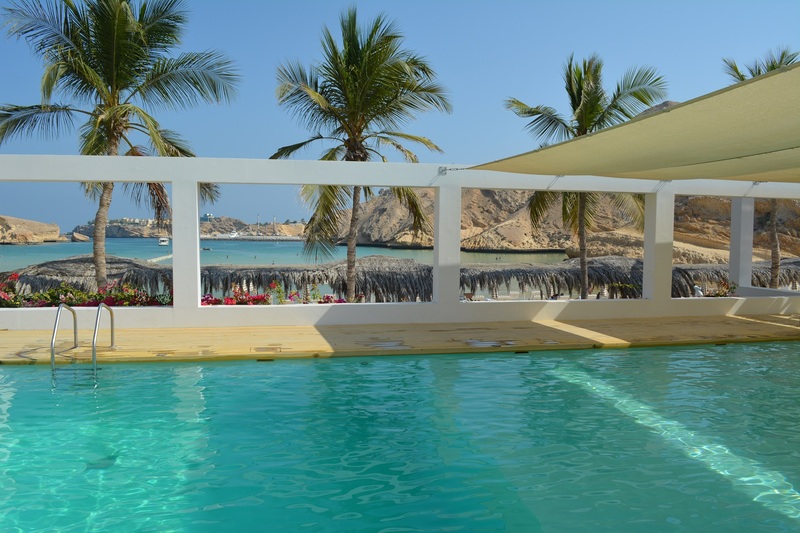 It’s “only” a three star resort so we’re not expecting that much but as soon as we arrive at the Muscat Hills Resort…. Holy moly!! Yes…. wow… we arrived yesterday at the end of the day so we had dinner and went to bed but let’s see where we are at and check this place out today! 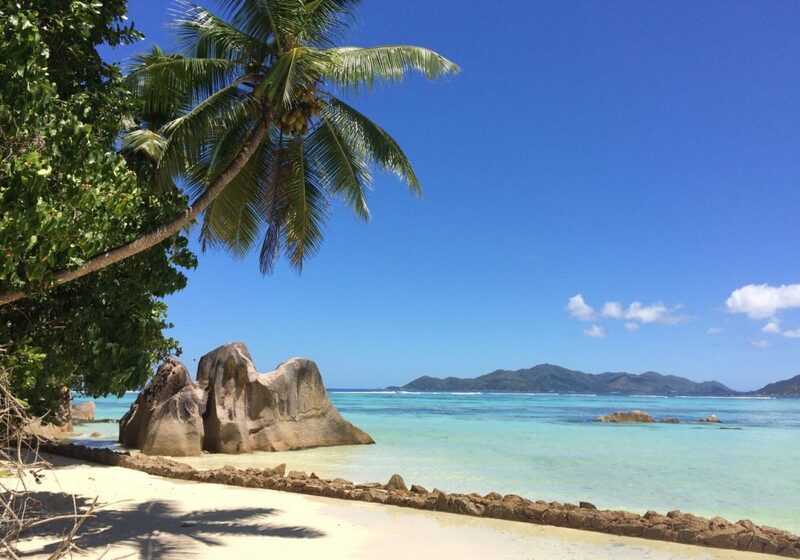 Such a paradise! 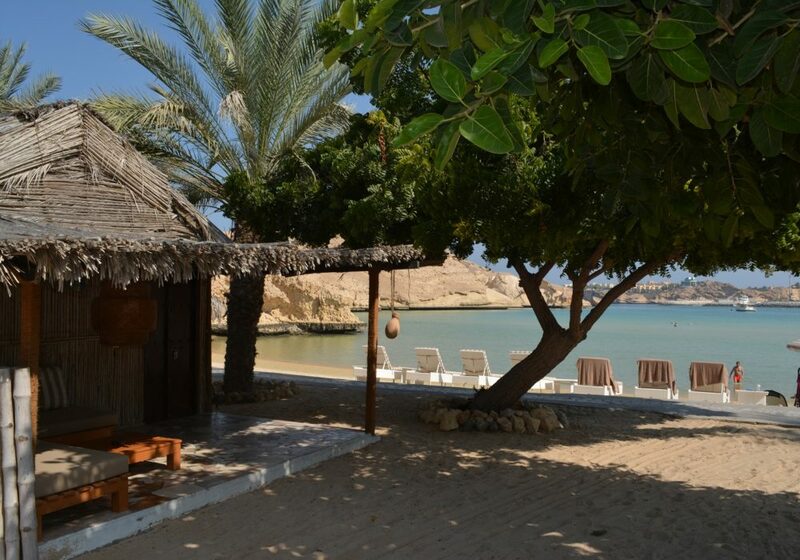 We sleep on the beach in an amazing idyllic beach hut with a straw roof and outside bath room. The (private) beach is located in a bay that is completely cut off from the sea so there are no waves and it doesn’t even get deep. 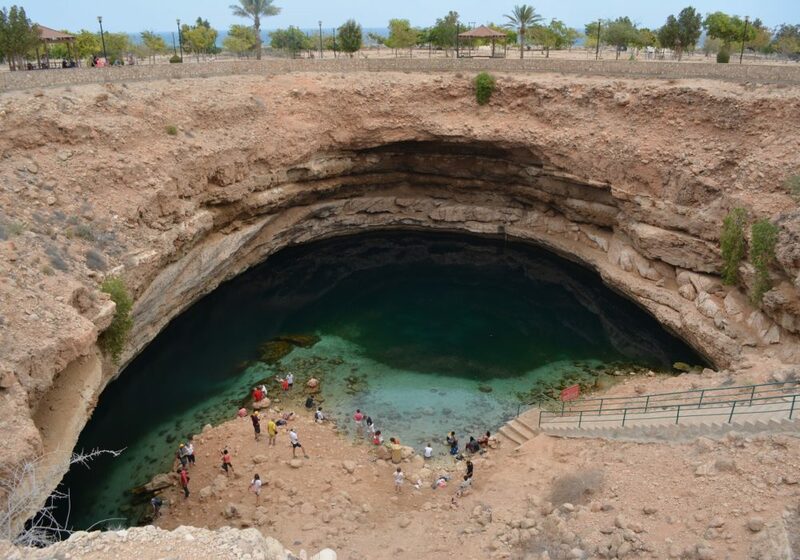 A perfect place to go swimming and playing with your kids! 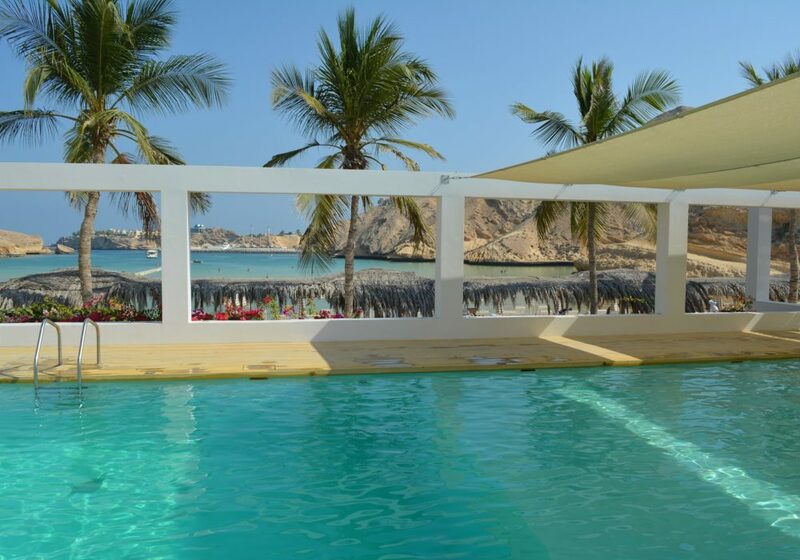 The resort itself is very luxurious, everything has a perfect finish, a beautiful pool, lovely sea and good food. So we could really relax here! These days are spent swimming, relaxing, eating and drinking and canoeing. Unfortunately, this is the day of our departure. We fly in the evening, so we have the whole afternoon to enjoy this lovely resort. I’m a little anxious for the night flight because you’re never sure if the kids will sleep allright. Luckily, we get an extra seat for the flight when we check in and we even get a baby bassinet for our youngest so she can sleep well. We have a good flight back and as soon as we reach Dutch soil we can only say one thing: Oman, you are great!!! This article is written by our regular guest blogger Kim. Kim has 2 daughters (4 and 1) and is pregnant with number 3. Together with her family she makes the most beautiful travels. Not just because she enjoys traveling so much but because it’s very informative. Its so much fun being able to show your kids deserts, mountains, temples and castles in real life instead of a picture book. Kim and her husband Adri see the world as one big playground and enjoy exploring it each time with their kids. Costs of a holiday in Sri Lanka with kids: travelling Sri Lanka with 3 kids, what are the costs? Our road trip through France and Spain, what did NOT go well?? Genoa with kids, 3 days intineray in this beautiful city! We bought a camper, time to go test-camping a weekend!